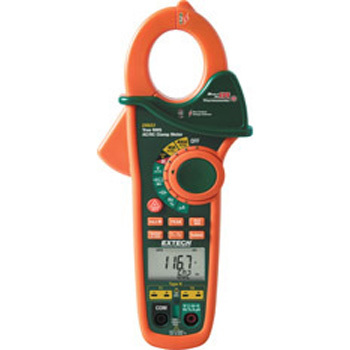 Extech EX623- 400A Dual Input AC/DC Clamp Meter + NCV + IR Thermometer – Infinity HVAC Spares & Tools Pvt. Ltd. True RMS measurements for accurate AC Voltage and Current measurements. Dual type K thermocouple input with Differential Temperature function (T1, T2, T1-T2). Built-in non-contact IR Thermometer with laser pointer for locating hot spots (up to 518°F/270°C). Built-in non-contact Voltage detector with LED alert. DC µA multimeter function for HVAC flame rod Current measurements. Data Hold plus fast Peak Hold of current surges during motor startup. 40,000 count multimeter functions for DC Voltage, Resistance, Capacitance, and Frequency for high resolution over wider ranges. Measures motor capacitors to 40,000µF.